This product was added to our database on Wednesday 12 August 2009. After the end of the second World War, the USAAF found the C-74 Globemaster was a very capable and useful aircraft. It began to consider acquiring an improved version proposed by Douglas. It used the same wing, tail and engines from the C-74, but featured a new and enlarged fuselage, as well as clamshell doors in the nose. The result was the C-124 Globemaster II. The YC-124 prototype made its first flight in 1949. 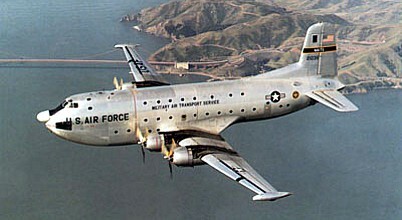 The first operational C-124 was delivered in 1950. It provided valuable service in the Korean war, but was deemed too slow in the Vietnam war era, so it was earned nickname "Old Shakey". A total of 204 C-124As, and 243 C-124Cs were built, a turboprop-powered KC-124B tanker variant was also considered. In 1970, most the C-124s were transferred to the Air Force Reserve and the Air National Guard. The C-124 was finally replaced by the C-5 Galaxy in 1974.